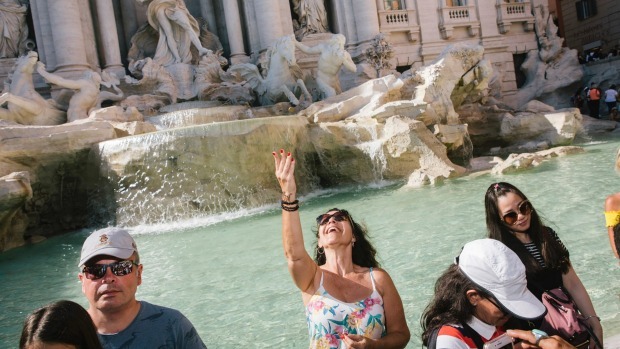 Throw a coin over your shoulder into Rome's Trevi Fountain, the legend says, and it will bring you good fortune and you will one day return to the Eternal City. It is an essential tradition for millions of tourists. But few will have suspected their loose change would also lead to a row between Rome's secular authorities and the Catholic Church. The 1.5 million euro ($2.38 m) of coins scooped out of the stunning Baroque fountain each year are destined for the Catholic charity Caritas to help the city's poor and homeless. Now Virginia Raggi, Rome's mayor, says the 4,000 euro worth of coins tossed into the fountain every day belong to her administration. From April 1 the donations will no longer be paid to Caritas but are to be used by Rome city council for the maintenance of cultural sites and welfare projects. The proposed changes, reportedly approved by the council at the end of December, have provoked a backlash from the Church. Avvenire, the daily paper produced by the Italian Bishops' Conference, launched an attack on the council in its Saturday edition, describing the city's bureaucracy as "the enemy of the poor" in a front-page article headlined "money taken from the poorest". Caritas confirmed that the changes would take effect from April even though it was still hoping the council would back down. "We did not foresee this outcome. I still hope it is not final," Father Benoni Ambarus, director of Caritas Rome, told Avvenire. Caritas said it had received an outpouring of support from politicians, clerics and journalists who supported its work and opposed to the move. But there was also a strong reaction on Twitter from those who said the church had no right to the donations. It is not the first time the council has sought to get its hands on the coins -donated to Caritas. The plan was first mooted in late 2017 by the cash-strapped city council, led by Ms Raggi, from the populist Five Star Movement. But the proposal was delayed for a year following widespread criticism. Caritas, which was founded in Rome in 1971, relies on the donations from the fountain to provide help to the city's homeless and families in financial difficulty. The tradition dates back to 2001 and has been continued by subsequent city administrations. The Trevi Fountain, which was commissioned by Pope Clement XII in 1732, was immortalised in Federico Fellini's 1960 classic film La Dolce Vita, in a scene in which Anita Ekberg waded into its waters in a black evening dress. The tradition of tossing a coin in the fountain began with the 1954 film, Three Coins in the Fountain. Apart from the furore over the fountain, the council is under pressure to clean up mounting piles of rubbish and to fix thousands of potholes in the roads and pavements of the city. According to statistics, the city has received 4,500 requests for compensation from drivers who claim to have suffered injuries on Rome's streets.